From the folks that brought us Harpeth Rising! I’ve seen Ryanhood and can say that they are awesome and 100% vetted by the ACMA music committee, so we are very excited to present Ryanhood to you! 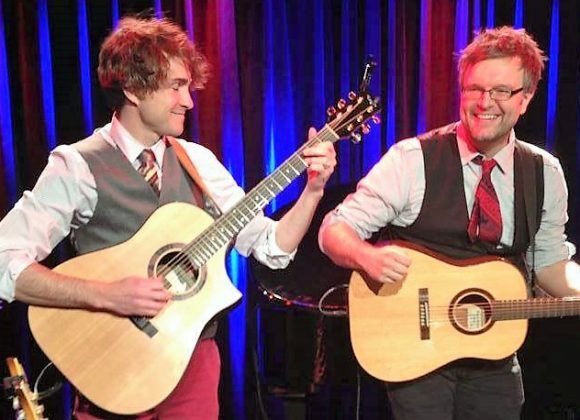 Named ‘Best Group/Duo’ in the 2014 International Acoustic Music Awards, acoustic-duo Ryanhood got their first break more than a decade ago as street-performers at Boston’s Quincy Market. It was there that they were spotted by a college booking agent and thrust into the college touring scene, where Campus Activities Magazine would name them “one of the most requested acts by college buyers all across the country.” They’ve since gone on to perform more than 800 shows in 45 U.S. states over the past decade and have shared stages with Jason Mraz, Matt Nathanson, Train, and many more. And their star is still on the rise. They were recently named the “Discovery of the Year” by John Platt at WFUV New York City, and were a featured act at Australia’s National Folk Festival in April 2018. Their sixth and newest album, Yearbook, is led by their signature two-part vocal harmonies, decorated with flares of guitar, ukulele, and mandolin, and centers on songs about being young, growing old, and making peace with the passing of time. They currently reside in their hometown of Tucson, AZ, where they have won more than a dozen Tucson Music Awards including “Best Folk Band” and “Best Rock Band” (you can decide for yourself which is most accurate).